The following excerpts are from the article Killing Amazon. Full disclosure: I have been speaking and writing about hydroponicfarming, soil-based farming, food production and last-mile food delivery since 2010. I heavily researched the topics at Deloitte, Amazon and Kroger and developed ideas and strategies for how to implement on-demand meals and last-mile grocery delivery. I researched the topics of business, strategy, innovation, supply chain management, logistics, transportation, agriculture, last mile delivery and finance as I earned an undergraduate degree and three Master’s degrees. When I enlisted in the Marine Corps, I became even more fascinated with food delivery as I watched food being prepared in commissaries on the base and then loaded into mobile kitchen trucks. Each truck had ovens for baking food as well as storing chilled and frozen food. Trucks could bake food while on the road and the trucks could be leveraged as stationary kitchens once they had reached their final destination. I fully understood that what I saw in the Marines could be applied to a civilian business model. Fast-forward to the present, and I believe we are about to witness a massive introduction of personalized, on-demand hot food delivered direct to customers. Customers embraced meal-kits but now they’re seeking even easier solutions for meals. At a high level, I believe the next big thing will be the creation of a fresh food and protein ecosystem integrated with automated industrial kitchens and facilities to prepare food. Trucks will be used to cook food enroute for delivery to customers. If a repeatable and reproducible ecosystem can be implemented for delivering fresh food and hot, cooked meals on-demand to customers at a low enough price point, consumers will slowly but surely change their shopping behavior. Instead of going to the grocery store or buying food online, consumers will rely on mobile meal deliveries. Grocery retailers such as Whole Foods could see a significant decline in foot traffic and revenue. If a retailer/company other than Amazon is able to create a nationwide delivery network for food, it has the potential of allowing the retailer to supplement or replace Amazon in the eyes of consumers. For example, a retailer could deliver meals, groceries and general merchandise direct to the customer. Based on my experience at Amazon when I worked for the company from 2015 to 2017, Amazon is at a disadvantage compared with Kroger and Walmart when it comes to the fresh food supply chain and especially the ability to deliver on-demand cooked meals. Marc Lore, president and CEO of Walmart e-commerce, understands the importance of this concept far better than most. Lore strongly believes that Walmart can create a competitive advantage by offering fresh food in stores and via last-mile delivery. By building trust with customers through fresh food and consumables, the relationship can be expanded to include general merchandise. Add in the element of being able to deliver hot, cooked meals on-demand and the value proposition with customers is significantly increased. Lore understands that fresh food and consumables are strategic to Walmart’s future. I’ve stated publicly many times since 2010 that I believe Walmart, Kroger and Schwan’s are the three companies best positioned to introduce direct-to-customer, on-demand hot meal deliveries but long-term, Amazon can become the leader in the space. I’ve also mentioned that Cracker Barrel, Chick-fil-A, Applebee’s and other restaurant chains could choose to enter the market. I believe Tesco , the largest grocery retailer in the United Kingdom, will be first to market with a solution in Europe. Walmart, by leveraging its supercenters and neighborhood grocery stores, can prepare meals for customers. Walmart can open food preparation kitchens in strategic locations around the U.S. and leverage its transportation knowledge to lease a fleet of mobile meal trucks. Or it can create a program whereby Walmart associates own and operate on-demand meal and grocery delivery trucks on behalf of the company. I prefer the latter solution as it ensures Walmart owns the entire customer experience. Schwan’s has tremendous potential as it already has expertise in building trucks to transport chilled and frozen products and Schwan’s has significant food manufacturing and food supply chain experience. 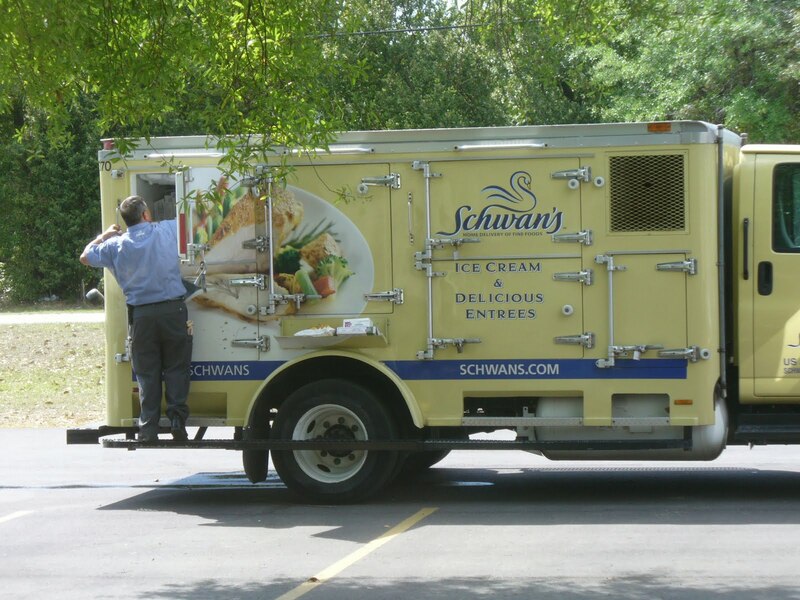 In discussions with Schwan’s in 2014, the company was confident that it could design a truck capable of transporting groceries for home delivery and storing food, as well as cooking food en route using ovens. Schwan’s isn’t a retailer, however, and I have been on the record since June 2017 that Amazon, Kroger, Subway, Walmart, JAB Holdings or some other company interested in the market should evaluate acquiring Schwan’s. Kroger especially has a tremendous opportunity to accelerate entry into this market. When I worked for Kroger as a consultant, I recommended that the company acquire a meal-kit company. Kroger’s recent acquisition of Home Chef provides Kroger with the ability to not only offer meal kits in its stores and online, but also explore options for cooking the meals sold by Home Chef and delivering the meals to customers. Kroger can leverage its restaurants and stores, especially its in-store delis, to prepare meals for customers. Kroger can leverage its food manufacturing prowess and supply chain to eventually own the entire process, from field to fork, to offer customers hot, cooked meals on-demand and groceries delivered to the home. I strongly advise grocery retailers, restaurant chains, food delivery companies like AxleHire, Grubhub, DoorDash, Amazon Restaurants and Uber Eats, and logistics companies like UPS, FedEx and DHL to explore this market. Based on my evaluation of the startups operating in this space, none have more capability or potential than Zume. I anticipate Zume will be acquired within the next 24 months. Papa John’s should assess acquiring Zume Pizza and making Julia Collins, co-founder of Zume Pizza, the next CEO of Papa John’s. Walmart, Target, Kroger, Albertsons or Amazon are the leading contenders to acquire the company. JD.Com is my wild card pick to acquire Zume. Amazon would be wise to take the threat of this new and developing market seriously. Acquiring Zume and/or Schwan’s should be a strategic imperative.